The way minerals are mined is changing. New technology and engineering is having a disruptive effect on the operating techniques of miners the world over. Advances such as remote operation, underground digitalisation and drone technology are systematically removing the human intervention in harsh and often fatal environments. 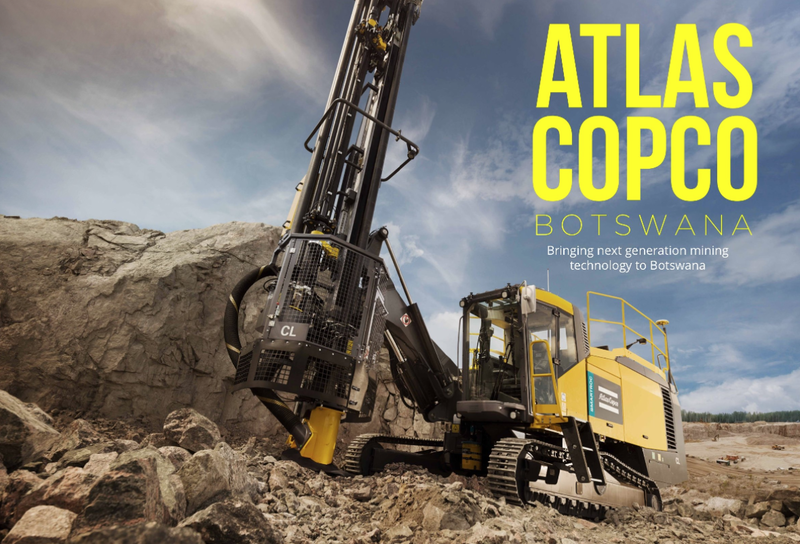 Atlas Copco Botswana is at the forefront of bringing new technology to the country’s mining industry through its state-of-the-art mining fleets. Technologies that have been proven in other areas could revolutionise the Botswana mining industry. Atlas Copco has a history in Botswana dating back to 1969 when the international mining construction and engineering giant established itself to provide compressor rental services for Botswana’s roadways development. Since then the company had ingratiated itself into Botswana’s most prominent mining projects. As the mining sector expanded in the 1970s and 1980s, sparked by De Beers Orapa diamond discovery in 1967, Atlas Copco began to concentrate on improving its mining offer for underground mines and became a key cog in major projects, for example having a 60-machine fleet at the BCL copper mine until it closed last year. Now the Atlas Copco has a dominant footprint in Botswana’s diamond mines through its relationship with De Beers’ Debswana. Archie Seleka, Atlas Copco Botswana country manager, explains the global supply chain derived from the parent company helps the national subsidiary maintain its place as a market leader for the Botswana mining industry. “We have very good direct support from our parent company, we have a very large setup of factories around the world that we draw our equipment and spare parts from, we have a good logistics supply chain and we have good support from the regional hub in South Africa. The Botswana subsidiary is also strengthened by having such a strongly established parent company, with a long track record of successful machine delivery and project completion. That backing has seen Atlas Copco Botswana play an integral role at Debswana’s diamond projects and Seleka sees that relationship continuing in the coming years. Debswana has announced it will be expanding the Jwaneng mine, the world’s richest diamond mine by value, to the next cut called ‘Cut 9’ and that process will require additional drilling machinery – Atlas Copco is in the position to offer drilling solutions in this regard. Atlas Copco is also well-positioned to win a tender for the next phase ‘Cut 3’ at the longstanding Orapa mine, with the existing drill fleet primarily run by the firm. “We stand a good chance, we have demonstrated that we are capable of reaching our customers’ requirements on these projects,” notes Seleka. A fundamental shift is underway in global mining as the industry transitions away from human intervention in the dangerous and harsh conditions of underground mines. The whole sector is trying to reach a point where minerals can be extracted from the ground without having to send a single person under the surface. While miners have been notoriously slow to adopt new technologies, automation and digitalisation across active operations is coming to fruition and Atlas Copco is acting as a world-leader in this area. Already in operations in Western Australia’s Pilbara the company is demonstrating its capabilities. It has drill rigs that are being controlled by mining operatives from a remote hub in Perth nearly 2,000km away, Seleka is discussing these possibilities with customers in Botswana to make site visits to Australia to show how effective the new technology is. “In Botswana the customers are very keen on new mining technology and we are leading [the market] in that respect. We are keen to bring the technology to our customers here,” notes Seleka. “Safety, efficiency and unit downtime are the three key drivers behind it. Importantly, you don’t have the human intervention element either which has always been an issue around optimising the value of the asset. While the new technology applications for mining machines offer great revenue streams for the company, it is a step in the right direction after a torrid couple of years defending itself against the global commodity price downturn that comprehensively rocked the mining industry from 2014. Atlas Copco Botswana had to tighten its belt and make changes to company quickly to maintain its presence. However, having reacted to the environment and made some difficult decisions Seleka is beginning to see light at the end of the tunnel. “It was a huge body blow for us and we had to cut back a lot. We had to retrench a lot of our staff, about 80 people nearly half of the staff when the big copper mine [BCL] closed down as well as the Ghaaghoo Diamond Mine going into Care & Maintenance. But that taught us how to think differently, cut back on our costs and become lean and mean – now we are in a position to attack the market. With the prices returning for Botswana’s two major mineral sources, copper and diamonds, there are a number of new projects coming online in the short term, and also operations that became uneconomical during the downturn are being reopened again, which spells a number of opportunities for Atlas Copco to return to its peak figures seen in 2015. The government is also helping to inject much-needed capital into Botswana’s mining industry with the development of new power plants backed up by new coal mines. Casting his mind forward Seleka expects major progress on the business side for Atlas Copco, “By the end of 2019 we want to have got back to where we were in 2015, that was our peak year in terms of machine delivery and we believe we can get back to that level. “Our target for the next two years is get to 80-90% of the 2015 level, that’s where we are heading and 2019 is looking very good for us.